Fries With That? is a microgame in the Strange folder in WarioWare, Inc.: Mega Microgame$! It reappears as part of Mona's set in WarioWare Gold. There is a bottle of ketchup at the top of the screen, and various fast-food items coming up from the bottom. The player must move the bottle with the , and douse the food with ketchup with the button. Moving the bottle is not necessary, though, as the fast food will always fly directly under the bottle's starting position. 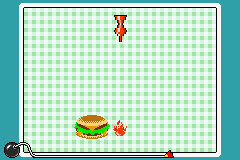 1st level difficulty: The only item that comes is a hamburger. 2nd level difficulty: The hamburger is joined by french fries. 3rd level difficulty: The hamburger and french fries are joined by a soft drink. 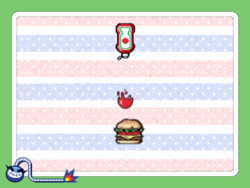 1st level difficulty: The only item that comes is either a hamburger or french fries. 2nd level difficulty: Two items, which can be either a soft drink and an omurice (which sway up and down) or a donut and a cupcake (which move across the screen diagonally). 3rd level difficulty: Three sushi must be squirted. French Avec des frites ? With Some Fries? This page was last edited on January 29, 2019, at 17:50.